yesterday was so fun-filled and enjoyable that i just need to tell you all about it! i first started off the lovely morning with my cousin brian. he was in town from san francisco this weekend for kyle’s bachelor party, and in an effort to not crash the events, he and i met up for an early breakfast before their festivities geared up for the day. i picked him up from his rented loft in downtown atlanta, and then we zoomed off towards memorial. as we pulled up to ria’s bluebird café, we sadly realized that it wasn’t open. even though it was quite early in the day, there were plenty of folks already at their tables on the sidewalk. the sun was beginning to peek up over the horizon with its warm rays, so we opted to eat inside instead. it was a fine choice to dine indoors, for we were perfectly placed to visit and enjoy the atmosphere. brian is one of the coolest people i know but is someone with whom i never get to spend enough time. considering he spent his childhood in san pedro, moved to new york for a few years, and is now in northern california, you can see how it would be hard to get together. thanks to more frequent family events and reunions, though, we’ve been pretty good about seeing each other at least once a year. ah, he’s just so cool that it still isn’t enough! our genial waitress brought the coffees and between sips, brian and i caught up on anything and everything. his job at apple is going well, he loves his new apartment, and he is stoked for the wedding in october. he’s one of the groomsmen for kyle, and you can bet he will be tearing up the dance floor at the reception. brian definitely has a wild side, and we’ll see just how far it is unleashed next month. 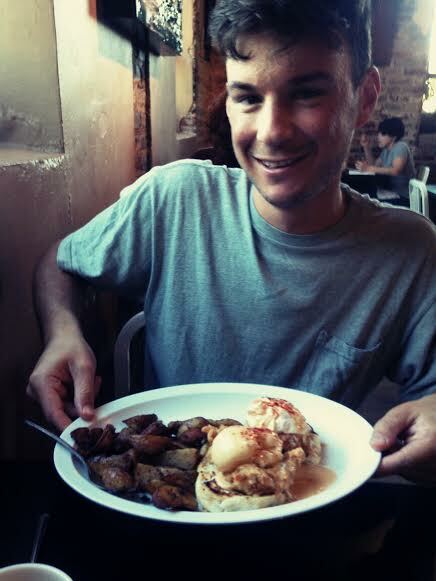 per foursquare’s recommendation, brian ordered the fried chicken benedict. he had mentioned he didn’t want anything too heavy, but i think this plate weighed a good bit. those little fried tenders were smothered in a jalapeno cheddar cheese sauce that looked unreal. brian said the dish certainly lived up to its hype. i really didn’t know what i was in the mood to eat that morning, but the sweet potato pancake caught my eye, and i figured that it would be quite delicious with my café au lait. first, the café au lait was very well made. it didn’t need any sugar or cream, and that, in my opinion, means you’ve got a great mug of coffee in your thirsty little hands. the pancake was dense and sweet and even more delicious with the caramelized brown sugar butter; and the side of bacon was thick and crispy. sometimes i like chewy bacon, but this crispy serving of pig was a great choice. our time together was coming to a close, as i had to meet up with some peeps around ten for an alumni event. it had been so wonderful to catch up with brian, and it makes my heart ache that i only get to see him every now and then. i suppose i’ll just have to make it out to san fran sometime soon. challenge accepted! i dropped brian off at his block and zipped up to piedmont park. the metro atlanta chapter of the uga alumni association was hosting a cleanup morning for our section of the atlanta beltline, and when i saw the event in my alumni newsletter, i thought it would be a fun way to get physically active and give a little something back to the community. although it was hella muggy already, at least we were in the shade. better yet, our section of the beltline is right near the gravel parking lot next to the park and the tavern, so we didn’t have too far to go to get to work. the organizers were ready to get us started, so some folks grabbed weed killer and the rest of us armed ourselves with clippers. the mission was to clear out as much bamboo as we could from the side of the trail. well, that didn’t sound too horrible…until we arrived at the bamboo…and that stuff was everywhere. and it was TALL. those stalks went up at least two stories, and we were supposed to cut them down? yep! so get to work! and got to work we did. i was felling those shoots left and right, and i was quite animated while doing it. “i am woman! hear me roar!” yes, those are the sorts of things i was howling as i gripped those shears and took to the bottom of the stalks. good thing i just recently bumped myself up to the fifteen pound weights at the gym. i’m a beast! p.s. when we lived on signal mountain, tennessee back in the 90’s, “beast” was my nickname when i played roller hockey at the local gym. i kid you not. after two hours of crouching and gripping and carrying, we called it an afternoon. we were pleased with our work, and it was a rewarding feeling to use our muscles and get in on some manual labor. i was looking super fine in my sweatpants and drenched baseball tee, so you can bet i was ready to hit the showers. but! i couldn’t get away without snapping these beautiful photos of the city behind the park. such crisp and clear colors! such life! and might i add, such life without a filter. booyah! i cleaned myself up, had a snooze, and called up kari. neither of us had plans the rest of the day, so day drinking sounded like a good idea. she picked me up from the condo, and we cruised on down to six feet under. this place is one of my favorites in the city with good food and good beer. however, the best part of six feet under just might be its view. i mean, can you beat this panorama? maybe, but for right now, this one from the westside will do pretty well. we kindly ordered beers from our waiter scooter and also put in for a plate of the gator bites. 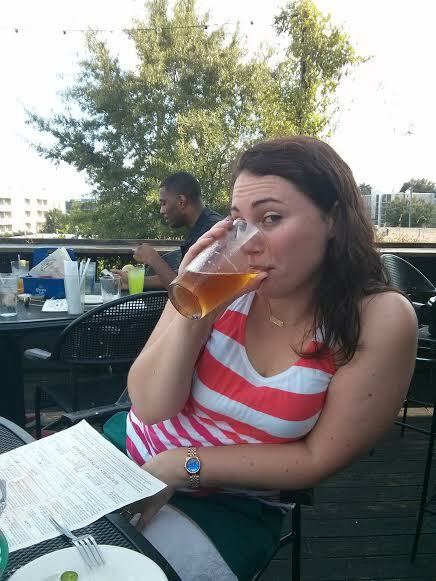 as we sat back and relaxed, i noticed the gentlemen at the table behind kari. when we had first arrived, it looked like they were drinking long island iced teas. but then, out of the corner of my eye, i spotted a bright green drink in the hand of one of them. i mean, we are talking the color of the ooze from teenage mutant ninja turtles. “um…YES.” it was a great success. you do you, bruh. you do you. our beers were nice and cold, which was almost a necessity since it was still incredibly humid out. there was hardly a breeze to be found, so we knew we were not going to last long outside. while we were there, though, we made the most of it all. the gator bites we ordered were delicious. i highly recommend you smother each bite in the sweet chili sauce; you might even need to order an extra ramekin of it. they went wonderfully with our beers, and we left six feet under feeling great and ready for more fun. let me pause here to say that i love getting drinks and appetizers at one place, going elsewhere for dinner, and then ending up at another spot for dessert. it makes me feel fancy and important. just saying. 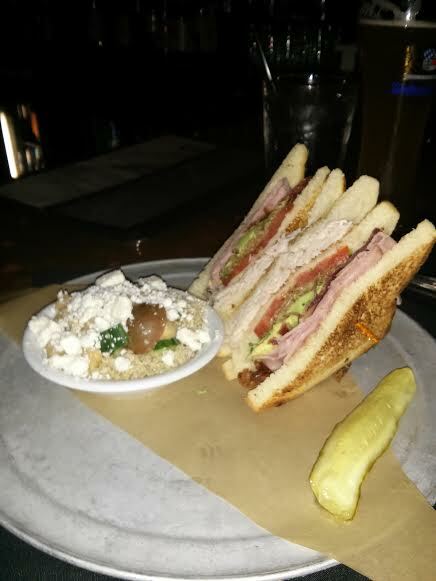 since we were already on the west side of town, it was easy to suggest we amble on over to ormsby’s. ormsby’s has been a hoppin’ spot ever since i can remember, and there are good reasons for it! they have an extensive beer list, friendly bartenders, fantastic food, and great bar games like bocce ball and shuffleboard. kari and i posted up at the bar upstairs so that we could watch some of the better football matchups of the day. figuring we would be there a while, we got things started with a bang and each had a kamikaze shot. kamikazes are one of milo’s favorites, and i have gladly carried on the tradition. bottoms up! bride and her maid of honor! if you know me at all, you know i know nearly no stranger, and after a couple of drinks, my level of nosy friendliness rises quickly. i mean, when you’re sitting at a bar, squeezed in, side-by-side with everyone, what do you expect? we chatted it up with a few folks to our left, talking football and cheering on southern cal in their nail-biting victory over stanford. go trojans! it was quite relaxing not having to worry about the dawgs this weekend, but believe me that i will be a nervous wreck until we beat the gamecocks next weekend. the evening drew on, and ormsby’s grew busier. one of the many things i love about being at a bar is the people watching. people from all walks of life come to a bar to escape from reality, to find a new friend, to enlist the kind ear of the barkeep, to throw back a few. it’s just such fun to watch and wonder why we’re all there. mm, yes. now, i only wonder what they all think of me. or maybe i don’t…? yes, perhaps it is better i don’t know. we kept the beer trend going throughout the night. 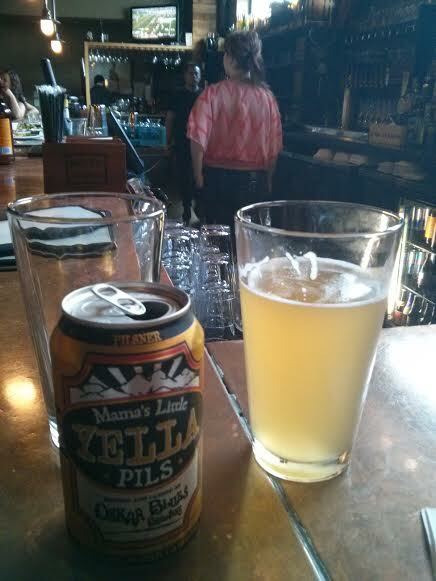 kari and i were both fond of mama’s little yella pils, although she kept it a bit classier by drinking hers from a pint glass. i shamelessly rocked mine in the can with a koozie all night long. hooray, beer! a friendly trio bellied up next to us a couple hours later. they were cheering on the michigan state spartans (such a heart wrenching loss last night!) and the florida state seminoles. considering neither team is in the sec, i’ll forgive them just this once. the one fellow jeff was pleasantly chatty and humored us ladies throughout the night. he had a snappy sense of humor but could take a joke in good fun. he and his group made for great company before they headed out for a concert later that night. bonsoir! kari and i finally got around to ordering dinner, and our sandwiches were just the perfect food to supplement all our cans and pints of beer. kari loved the richard sandwich she ordered and was quite pleased with the quinoa salad she had ordered to go with it. i can definitely agree with the quinoa salad statement, as she let me have a bite with a huge chunk of feta. mm, feta makes it betta. as for me? it took every ounce of me not to order the fish & chips. it is my favorite thing on the menu next to the bangers & mash, and i nearly say every time i come that i will try something new. 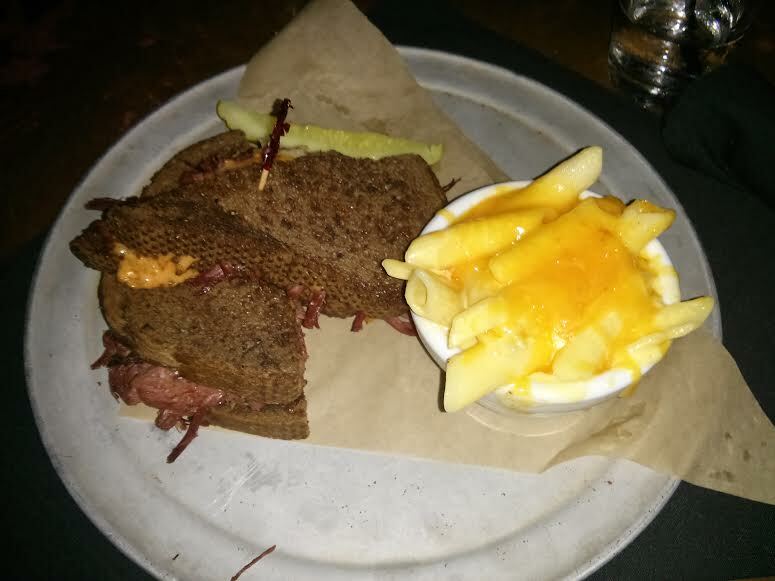 so last night i kept that promise to myself and had the reuben. the pumpernickel was nice and toasty, and the thousand island was slathered all over that bread. i was totally fine with it all. oh wait! let me mention the best part of my meal: the bouillon dish of mac’n’cheese. that cheese was oozy and rich and all in those ziti noodles. i had told jeff he would regret ordering those grilled fish tacos, and i savored each bite in front of him. aah, a fine form of torture. around eleven o’clock kari and i tapped out, paid the tabs, and waltzed out into the warm summer night. even though we’d had a hoot of a time last weekend for her bachelorette party, it was the perfect day for a little more girl time. until next time, goodnight, atlanta!